Online payments by phone and email. Credit card processing with no setup fee, no monthly fee, and no locked in contract. Despite what you may be thinking, it's not too good to be true! Want to see what a payment looks like? Watch this demonstration to see how it works. You can accept credit cards on your website, and over the telephone. See some examples to learn how to set it up, or visit the FAQ to get answers to common questions. Try it out, there is no setup fee! Accept.ca is the first service of it's kind in Canada. We provide you with an online payment page where your clients can submit payment by entering their credit card number. 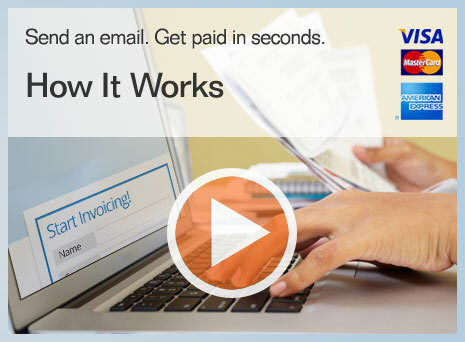 It is simple, secure, and allows you to send your clients an invoice (any type of invoice) right through your regular email program such as Outlook. When your client gets the email, they click on the link to your payment page (which can be hosted on your own website or on Accept.ca) and submit payment instantly using their credit card. It has been built with the singular purpose of stripping away anything remotely complicated, in order to make it as easy as possible to accept credit cards online. We bundle this solution with a virtual terminal so you can also take credit card payments over the telephone. This is all provided with no setup cost, no monthly fees, and no locked-in contract or commitment of any kind. The only fee you pay is a rate of 3% plus 30 cents for each transaction processed. We did this to remove as many of the roadblocks as possible that typically prevent businesses from wanting to accept credit cards. You will be able to accept Visa and MasterCard payments, with the option of adding support for AMEX as well. Once you try it you will be hooked because you'll realize just how much easier it is to get payments from your customers. (Not to mention how much faster you get paid.) If try it out and decide it's not for you, just stop using it. If you are curious to see how it works, but aren't sure if it's a fit for your business, we encourage you to try it out on a trial basis. That is exactly why we have structured it with no upfront costs, and almost no work involved in setting it up. Although there is often a perception that e-commerce based credit card processing is complicated to setup, you will find that is definitely not the case. Start slowly with a small payment and see how it goes. Before long you will realize how easy it can be to receive payments from your customers online. Credit card processing doesn't need to be complicated, it can be simple. However, we are not content to rest on our laurels. If you have any ideas in terms of how we can improve the service, or better meet the needs of your business do not hesitate to contact us. May we suggest viewing the pricing, or take a look at some examples to see how it works.